Date | Time Thursday, Feb. 7 | 7:00 p.m.
North Bay, Ont. 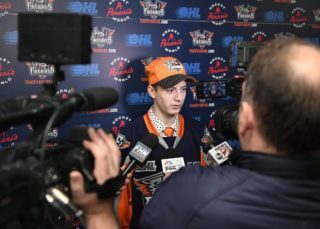 – The Flint Firebirds headed North Wednesday morning to prepare for a Thursday evening contest against the Eastern Conference’s North Bay Battalion. Puck drop is set for 7 p.m. at the North Bay Memorial Gardens (capacity 4,043). Thursday marks the eighth all-time meeting between the two clubs where Flint holds a 1-5-0-1 record against the Battalion since 2015. The Firebirds are 0-2-0-1 in North Bay. Thursday is also the final meeting this season and the only contest in North Bay. In October, the Battalion got the upper hand on the Firebirds at the Dort Federal Credit Union Event Center. That night, Flint fought back to tie the score three times in a very physical battle with North Bay, but the final score favored the visitors 5-3. For the Firebirds, Ty Dellandrea (Dallas Stars), Hunter Holmes and Eric Uba lit-the-lamp. Between the pipes, Emanuel Vella stopped 20 of 25 shots. North Bay’s Justin Brazeau and Adam McMaster each scored twice and gained two assists for a four-point night. The Battalion enter the contest with a season record of 23-24-2-2. They sit fourth in the Central Division and seventh in the 10-team Eastern Conference. They’ve won three of their past 10 games. The Firebirds are fifth in the West Division and 10th in the Western Conference. Flint has two wins and points in three of their last 10 games. On special teams, the Battalion rank fifth in the OHL on the power play, scoring 25.1% of the time. The Firebirds are 20th converting at a 13.8% clip with the man-advantage. North Bay ranks ninth on the penalty-kill, shutting down the opposition 79.2% of the time. The Firebirds are killing penalties at a rate of 70.0%, which is 19th-best in the OHL. Firebirds’ captain Ty Dellandrea (Dallas Stars) leads Flint in assists (35) and points (52) through 46 games. Alternate captain Jake Durham leads Flint in goals (31) and is second on the Firebirds’ roster with 49 points in 52 games. Ethan Keppen ranks third with 40 points (20G, 20A) through 52 contests. Keppen has three goals in the past two games, and points in 12 of his last 14. On the blue line, Vladislav Kolyachonok leads all first-year players and defenseman with 25 points (3G, 22A) in 38 games. Second-year defenseman Riley McCourt has played in 34 games this season, and tops the defensive troops in goals-scored with five. He has 24 total points for the campaign, and is riding a five-game point streak (5A) into Thursday’s contest. In net, overage goaltender Emanuel Vella holds a 4.92 goals-against average (GAA) and a .874 save percentage (SAV%) across 31 appearances. Second-year goaltender Luke Cavallin has a 5.26 GAA and a .865 SAV% after appearing in 28 contests. Vella and Cavallin each have four wins between the pipes. NHL: The Firebirds have two players with NHL ties consisting of Dennis Busby (Arizona Coyotes) and Ty Dellandrea (Dallas Stars). In addition, Luke Cavallin, Kyle Harris, Ethan Keppen, Vladislav Kolyachonok, Eric Uba, Cody Morgan, Emmet Pierce and Jacob Winterton are eight first-time eligible skaters for the upcoming NHL Draft in June. 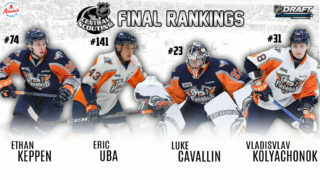 Cavallin, Keppen, Kolyachonok and Uba were among the 50 OHL Players in NHL Central Scouting’s Midterm Rankings ‘Players to Watch’ list for the upcoming NHL Draft. Despite Flint playing in just their fourth season in the OHL, Alex Nedeljkovic (Carolina Hurricanes) and Kole Sherwood (Columbus Blue Jackets) are two former Firebirds to play in the NHL. Ty Dellandrea (Dallas Stars) and Vili Saarijarvi (Detroit Red Wings) have played in NHL pre-season contests. North Bay’s Justin Brazeau is second among all OHL skaters with 85 points (45G, 40A) in 51 games played. He has 11 power-play goals, seven game-winning goals and is on a four-game point streak. Former Owen Sound Attack member Matthew Struthers is second on the Battalion roster with 59 points (22G, 37A) in 44 games. Brad Chenier ranks third with 49 points (23G, 26A) in 47 games. Between the pipes, Christian Propp holds the OHL’s 17th best GAA at 3.84 and also holds a .895 SAV% playing 39 games this season. Christian Purboo has recorded a 3.44 GAA and a .906 SAV% through 15 games. NHL: Mason Primeau (142) is the lone Battalion skater in NHL Central Scouting’s Midterm Rankings ‘Players to Watch’ list for the upcoming NHL Draft in June. Three notable North Bay Battalion alumni to play in the NHL are Michael Amadio, Barclay Goodrow and Nick Paul. Dating back to the Brampton Battalion, seven notable alums to play in the NHL are Brent Burns, Sam Carrick, Matt Duchene, Thomas McCollum, Jason Spezza, Raffi Torres and Wojtek Wolski. Thursday evening’s contest against the North Bay Battalion can be heard live on the radio throughout Flint & Mid-Michigan on US 103.1 FM, online at www.us103.com or by downloading the US 103 app here. Dominic Hennig will call the play-by-play action on the Flint Firebirds Hockey Radio Network. Pregame coverage will begin 30 minutes prior to puck drop at 6:30 p.m. The game will also be televised live in North Bay on YourTV channel 12 / 700 (HD) for Cogeco cable subscribers. In addition, the game will be televised province-wide throughout Ontario on the OHL Action Pak on channel 445 for both Rogers TV and Cogeco TV cable subscribers. OHL fans with cable television in Ontario can add the OHL Action Pak to their television plan to catch the Firebirds in action, home or away all season long. Along with Thursday’s game, 65 of the Firebirds’ 68 games throughout the 2018-19 season are also scheduled to be televised live across the province of Ontario on the OHL Action Pak. All Flint Firebirds home and away games throughout the 2018-19 season can be watched anywhere in the world online on www.ohllive.com or on the OHL Live app. OHL Live is a league video streaming platform that delivers high quality live and on-demand coverage of all regular season and playoff games annually. 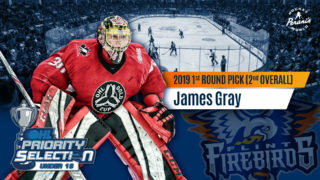 The cost is $6.99 per game, $69.99 for Flint Firebirds away games only, $179.99 for all 68 home and away Firebirds games and $279.99 for all 1,360 OHL games throughout the 2018-19 season. The Firebirds return home to the Dort Federal Credit Union Event Center for a 7 p.m. tilt next Friday, Feb. 15 against the Oshawa Generals. Friday marks the second-annual ‘Credit Union Night.’ All fans with a Credit Union debit or credit card (or proof of membership) can buy one ticket and get one ticket free for all price levels at the box office. Friday is also a ‘4 Pack Friday,’ featuring (4) tickets, (4) hot dogs and (4) soft drinks, starting at just $60. Additionally, Friday is the Firebirds annual ‘Talk Today’ game. The Flint Firebirds, the Ontario Hockey League and the Canadian Mental Health Association (CMHA), Windsor Essex County Branch are teaming up to raise awareness about the importance of mental health. A CMHA-run kiosk along with McLaren Flint, Genesee Health System and Helping Hand Autism Services will have tables set up to encourage discussion on the arena concourse so fans can learn more about mental health. Pictures featuring Flint Firebirds players promoting the importance of mental health, including public address announcements and video board messages will be played throughout the event. Single game tickets for all Firebirds games are $12 Bronze, $16 Silver, $20 Gold and $26 VIP seating (Seating Chart). All seats are reserved / assigned seating. Fans can purchase tickets by calling (810) 744-0580, in-person at the Dort Federal Event Center Box Office or online at ticketmaster.com here.